I can't believe this day has finally come. I'm not sure I can really put into words how I feel about this. I have some very mixed feelings about this project. It has had a long history and has been a long time in the making, not to mention way overdue. As with all stories, we may as well just start at the beginning. This translation was officially announced in February 2003 although work began sometime before that. I have always practiced never officially announcing a project unless I am committed to finishing it. It's been so long, I can't even remember when I first worked on it anymore. Suffice to say; we're somewhere around the 4-year mark now. This project is one that I have to admit, I really underestimated, and I don't do that very often being a 10 year veteran. This game was just a monster of hard coded values and inconsistent ways of doing the same thing in different parts of the game. I can't count how many menu lines (That's right lines not screens)and pointer values I had to trace out individually because they were hard coded and done differently than anything else in the game. While the game had it's share of technical challenges for an SNES game, it wasn't the technical difficulty that was the problem. It was the sheer amount of time it took to deal with all these inconsistencies and hard coded values. 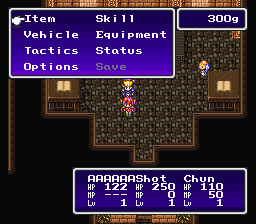 One good example was the battle text strings in the game. Each one had hard coded pointers and was usually assembled from sub string pieces in many cases. There were times where I thought I'd never find them all as I couldn't come up with any easy fool proof way to locate all of them as some strings were normal, some were assembled, all were hard coded, and few were consistent in the way called in code. One by one though, they were taken down and were all successfully dealt with. Beyond that, the project suffered a huge setback in 2005 as a result of a failed partnership with RPGOne. I'm not going to dig up old drama, but long story short, the project was set back by almost one year while unfinished, buggy, sub par left over work from the failed partnership was fixed up and redone. Some problems as a result of this weren't discovered until sometime in 2005 when the first round of real testing was being done. Having to back track at that point in the project really caused a set back. 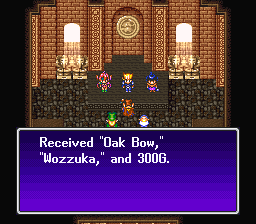 This is the primary reason expanded item names never made it into the hack. 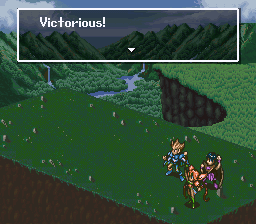 At long last, after 4 long years this game has been completed. I think it is a hell of a translation that many of you will enjoy. I for one am happy to put this project behind me because I spent way too much of my life working on it! My only regret is I never had the time to give a proper expansion hack to the 8x8 in the game. I estimate it would probably have delayed the project another 6 months to a year because so many parts of the game rely on 8 character limits. It would break a lot of code including battle text, battle arena text, treasure chests, inventions, menus, vehicles, robots, and more since Wozz loves to hard code everything. Beyond that, after 4 years, I just don't have it in me to work on this game anymore. I don't want Wozz on my tombstone as my life's work and legacy! It's better that my talents were focused on other projects now. So, I hope you can forgive this one flaw in an otherwise wonderful piece of work in my opinion. I really hope you'll enjoy 4 years worth of my passion for and dedication to this hobby and community. I freely and proudly give you the opportunity to play Wozz in English. Thank you to all who have given me words of support, all who have given a helping hand to the project, and the fans of TransCorp and our community. Take it, love it, cherish it! Jonny: One thing that did come out of the RPGOne alliance and make it's way into the game was some phenomenal graphics hacking and art work by Jonny. It's a pretty rare talent to be a good hacker AND a good artist, but Jonnny seems to pull it off nicely with several graphical hacks throughout the game from the concept of the new English title screen to the final screen of the game. Thanks goes out to you for a great job Jonny, wherever you are. Your work was appreciated! Akujin: Akujin, the same translator who did Dual Orb 2 for us, did the script for Wozz. He did an initial rough draft of the main script and then disappeared. He pulls more disappearing acts than the best magicians,but we couldn't have done it without him. Beta Testers: Finally earlier this year the project hit final beta. I would like to thank the beta testing team of Gideon Zhi, Princess, King Mike, Trunkz0r, Liana, and Misty for finding and filing 207 bugs and issues into the bug tracker! Wozz had a very complex and delicate scripting engine and nearly 4 years worth of compounded work in it and I was happy to have such a great team to track down all of those issues. Thank you beta testing team! 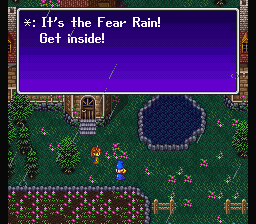 This game is 16-bit masterpiece. It was way ahead of its time with great depth to the game play and innovative features. 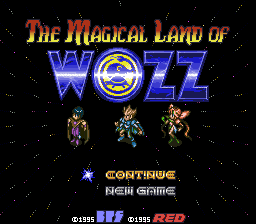 Along with the typical RPG fare, Wozz adds an invention system, vehicles, robots, 8 playable characters, three different branches of story depending on which of the three main characters you choose. To top it off, it has three different endings to go with it. This game is a lighthearted humorous spoof on all the typical RPG clichés. 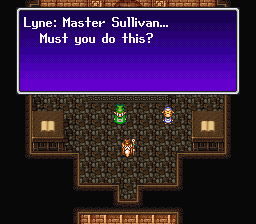 It may not have the epic serious storyline of FFVI, but it doesn't have to. Wozz is there to be anti-RPG, to make you laugh, and more importantly to make you have FUN. I think it excels at being a fun game. It was a fun game to play for me from beginning to end, and had me laughing out loud in several parts! The graphics are at first glance average, but a lot of attention to character detail and animations can soon be seen throughout the game. They definitely aid in bringing the world of Wozz to life. One quick example is each character has his/her own eye bugging/popping, laughing, and anger animations. It was really a nice touch to make the game more colorful and bring the script to life. Following that up, the game has a pretty nice soundtrack and I found myself humming a few tunes at night while trying to get to sleep. Many tunes were great, some were average, but hardly any were bad. 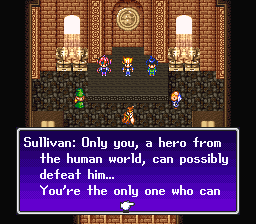 Because the game is different depending on which character you start with, it was very hard to test everything. If you find any bugs, please report them at the TransCorp message board. Easter Egg: You will also find myself, Nightcrawler, hidden in the game somewhere. 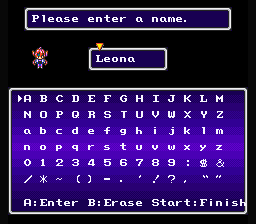 I used the custom purple sprite seen in the intro, so you will know it when you find me. I will also have a good explanation for wearing such a ridiculous outfit! Beyond that, Wozz has quite a few of it's own secrets, so there was no need to add any others. Kudos to those who find and get everything in this game. As of right now, there are no known issues, but you may want to be aware of one or two things. If you don't activate the Telepa-Box in Journey, you will get no text when you get to other boxes in the game because there is nothing to connect to. This is in the original game, but may seem like a bug. The item 'OkuParts' may seem to not work sometimes when used in the over world from the Item menu. Move this item further up in your inventory and it will work properly again. This appears to be a bug in the original game. 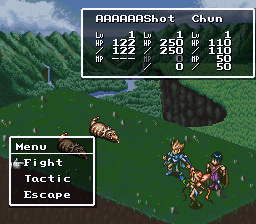 Most versions of ZSNES show the battle damage numbers behind the sprite characters. This is due to an emulator bug. 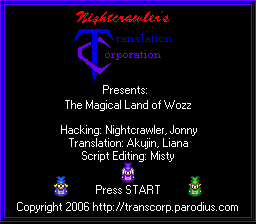 Only the most recent ZSNES WIP(Nov 12, 2006) versions can display this correctly. Either obtain a WIP version from the ZSNES message board (at your own risk) or use a different emulator such as SNES9x or BSNES that does not have this problem.